I first saw a project like this on the good old y-tube. 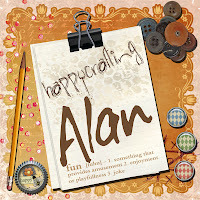 [A place of great resource for information and for giving the crafting mojo a kick start!]. So if this was your idea i thank you and i'm very sorry that i have not given you a name check. This project started out as a Children's Cardboard Book! i know its a fab idea. So now all those car boot sales [it's where i bought about 10 last weekend all sizes] now mean we have another source of crafting buying. I paid 10p for this book and it is approx 7 inches square and has 5 inside pages. This would be the max. size in content maybe go to 6 pages not including the cover and back. This project is 90% paint driven. 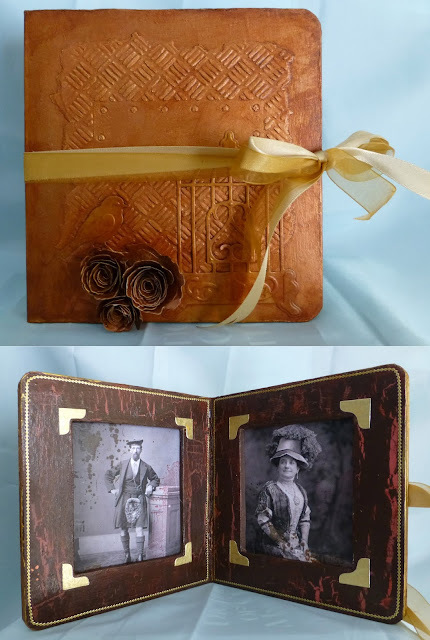 Apart from the embellishments which spellbinders dies and embossing folder was used..... Oh and Peel-off's I never thought i would use them again lol. Paints, Embossing Folders, White Card, Brushes and mediums are all available from THATS CRAFTY ON LINE. A store that's brimming with wonderful crafting items. Spellbinders Dies = Rolled up Flowers, Bird and Bird Cage. Spellbinders M-Bossibilities Folder - Industrial. Sharp Tipped Craft Knife [and extra Blades]. Distressing Ink Pads = Vintage Photo - Walnut Stain - Aged Mahogany. Acrylic Paint Dark Brown e.g. 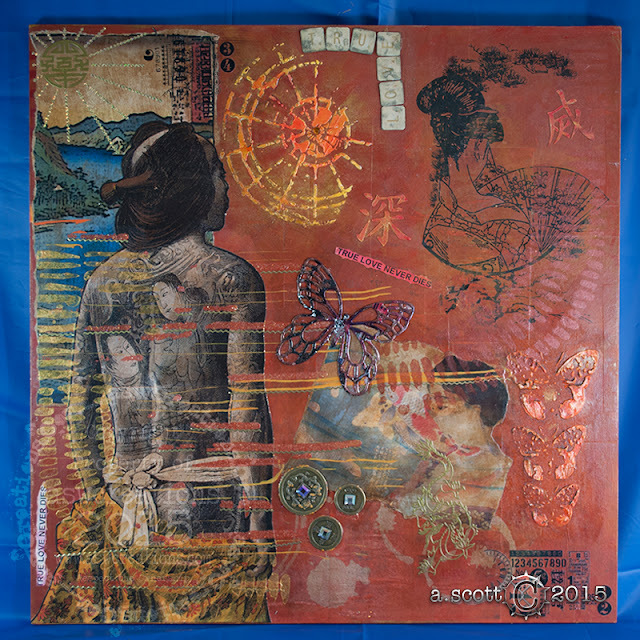 = PaperArtsy Fresco ~ Cinnamon - Pebeo Deco Matt ~ Ash Brown - Claudine Hellmuth Studio ~ Sable Brown - Eco Green - Mulch.. Patterned Paper to cover front and back. LETS MAKE A PHOTO FRAME! This is the sort of children's book that is used in this project. You can see that the pages are nice and thick. This will give strength when secured together. So that the frame opening are the same i made a paper template so that both sides are equal. To help secure the pages together, sandpaper is used to help give a 'tooth or grip' when we glue them together. Make sure that you go around all the edges. The center is going to be cut out so you dont have to pay a lot of attention to that area. By useing a good Ultra Stong double sided tape and Mod Podge Matte secure the pages together in the two sets you have. One side here had 3 pages the other side had 2 pages. To help set the pages i used some plastic d.i.y. hand clamps. Using the paper template the area to be cut out was drawn onto the surface of the 'Middle' pages. Using the sharp craft knife i started to cut out the openings. I used a metal edge ruller first to give a line where i could then follow freehand with care. The 1st opening is done. Don't throw away the middle as you can use this as a guide for your photograph. Both sides have now been removed. White Gesso was used now to cover the printed illustrations. I was going to leave the front and back like this and build textures onto it. However it did not fit into the 'Victorian' feel l was looking for. Gesso came out again. Its just the Multi Media Artist best friend! Using the embossing folder and some scrap card i ran this though my machine and then ripped the edges. Using Mod Podge Matte it was secured onto the front. To give that Victorian feel i used a Dark brown Acrylic paint to cover the inside of the frame. Now then this is where i had inspiration flash No2!. It just didnt feel as if it would look right so, armed with my NEW best friend i mixed in some gesso to lighten the base. Then taking the red acrylic paint i just put a few 'blobs' down in a few places. Not being precise i started to then dry mix [by this i mean .. using a dry brush and a light touch drag the paint over the surface. You can see the next step at the top.. The watered down PVA glue. Then i reused the brown that i originally used in the first step. The finished layer as you can see the crackle has worked brilliantly. To help protect the crackle layer i used a Gloss Acrylic Medium. Now them lets start on the photographs. I have a selection on file that have been kindly offered out to crafter's to use in their own projects as long as the person downloading does not 'SELL' them on as their own imagery in a collection or as a single item. So please abide by the owners copyright rules. As this project was not going to be sold i am okay. So to add some age to a printout by mixing the inks up a bit and using what can be seen as 'Aged' Marks. So this stamp set is just perfect! Now that the frame insides was dry i looked at it and okay it had a nice crackle going on but that was it. So i honestly didn't think i would ever dive into my old Peel-off's. I honestly did not think that by using the peel-off's it would give that finishing touch to the frame. It also made it look more Victorian to me. Once again i picked up the Gel Medium to pay down a protective layer. This would also help keep the peel-off's secured. The finished middle. The photographs had been secured, it was ready for making permanent. The front and back now needed some attention. Using the gold's and the Bronze's mixing them on the project and not on a pad or tile. i an able to use all the paint and to mix then in a mottled effect. This is where you have to take great care part 2. Using a HOT GLUE GUN. PLEASE PLEASE keep it away from anything that might knock it over, also use it on a surface that's not going to melt itself. Here l have used my old stand by a 20 x 20 inch sheet of MDF. Once the glue has become very very hot your able to lay down some glue all over the front and back. pressing it together until set solid. Using a gold acrylic paint the edges were painted. This hopefully would make the frame look like 1 and not a book glued together. i was still not happy with the front it just did not look like a Victorian Photo frame. They are from what i can remember very elaborate. So armed with some spellbinders metal dies i started to build up some elements. This is what the cover of the frame looks after the paint had been moved about on the cover with the help of a baby wipe! [Multi Media Artist best friend No 5]. So there you have it a Children's reading book rescued from the unwanted bin and turned into something else. I will revisit this project again in the future however i'm going to give the frame a completely new look. Will go all Modern on the feel. It will be nice to see what can happen and what kind of journey it will take me on. There is one other thing i would like to share with you. This photograph is showing you something that we all use and just throw away. The paper on the right is a paper mixing pallet. Its got a waxy surface that allows you to lay down colour and mix it. It also can be refreshed with a 'spritz' of water. The other paper is a Children's Tracing Pad. Why am i showing you both? Well they are both paper...... They both have Paint on them... THEY ARE BOTH GREAT MIXED MEDIA ITEMS. After i have mixed the paint on the paper pallet i then remove the paint by removing it on the tracing pad. Then when it comes to washing the brush i only have a little. The paint is not being washed down a drain! It is something that i can highly recommend you using when using wet paint media. Any questions please send me a message and i will get back to you as soon as possible.